A behind the scenes look at film and television Prop making peppered with everything else creative we do! When I lent my services to a collegue who was working on a film about 12 years ago, I was introduced to the world of cnc. I remember watching this huge machining centre milling out a slab of mdf and turning it into a fantastic set of gears. 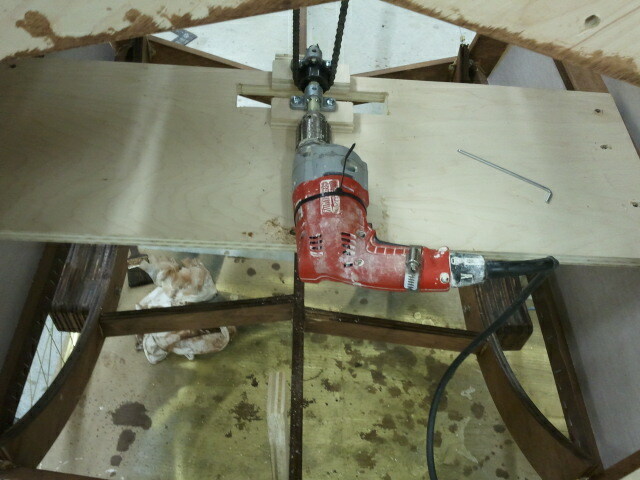 I knew that it would have taken me hours to achieve the same thing with traditional power tools. I decided then that I would invest in a cnc router for my own business Oxenham Design. At that time I could turn on a computer, but even to check email seemed like a crazy set of operations. I persevered and learned every piece of relevant software I could get my hands on. 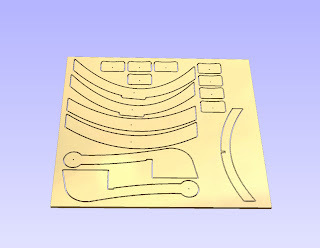 I am now fortunate enough to be using Vectric's ASPIRE software, and Techno cnc routers, which has helped us to create some amazing projects, both in part, or in full. I thought that this blog would be a great place to share "behind the scenes" adventures with the software, materials and equipment we use, as well as the projects we build. I got an email today letting us know we needed to stop working on the custom 'rock/paper/scissors' trophies for an upcoming t.v. spot. It seems there was a change in art direction and they needed to re-work some things. 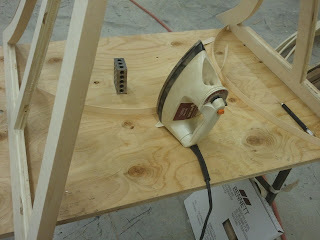 This wasn't overly upsetting as Christian, who owns Brilliant Creative, has been designing some office furniture and wanted our help with cnc-ing a lot of the panels. Christian was the designer of the colossal LG trade show booth we worked on in the summer. This furniture is a little kooky! I love it. His designs are solid, and as he works mainly in Adobe Illustrator, so his files were almost good to go in Aspire. 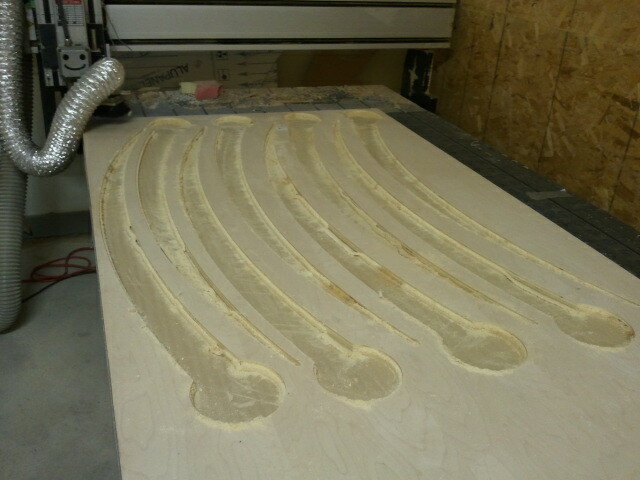 It didn't take anytime at all to toolpath them, and our Techno cnc made some pretty short work of the 7 sheets of maple ply. Oh yeah, you can bet they'll be more edge-banding for sure! 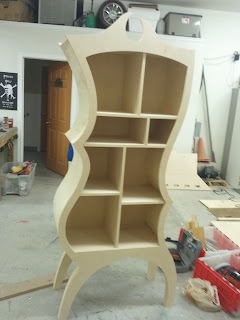 We got all of the pieces cut, and the main 'Armoire' built. 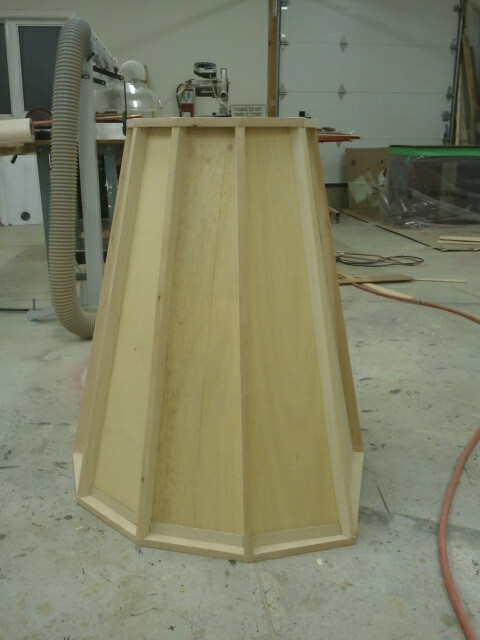 It still needs veneer on the sides, but the structure is done. This office will have maple counters that snake along most of the walls, so there will be plenty of working room at his studio. I think it's all gonna look pretty cool. Very whimsical, yet still very professional. 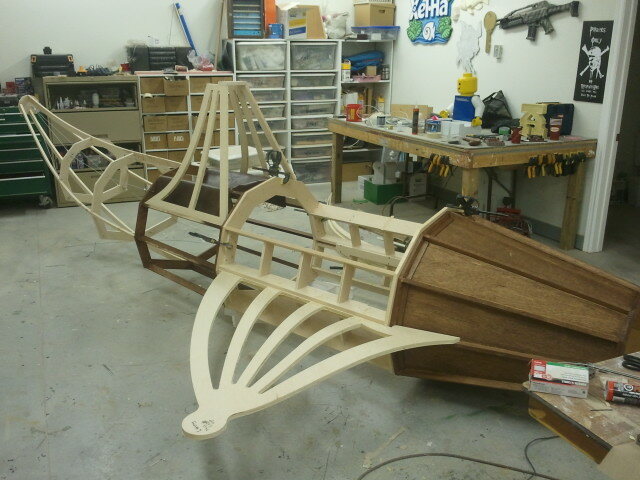 We will work on the other components later this week. On another note, I will be heading to the Woodworking show at the International Centre in Toronto tomorrow to see whats new and exciting in the world of tools and tooling. I know, I'm lame! Sunday was a full bore day at the shop for Jody and I. We wrapped it up at around 2 am Monday. We weren't quite done, but the truck wasn't going to arrive until 1 pm on Monday so we headed home for some sleep. Albeit a short sleep! 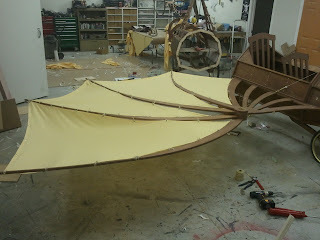 We got the wings finished up by 11 am, and they looked great when all spread out. Sunday also saw the build of the scale model. The model is supposed to be a predecessor to the large one. 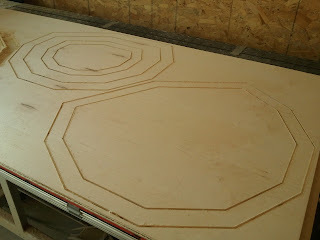 I had drawn all the parts Saturday night in order to cut them on Sunday. A fairly simple model that really only took a couple of hours to cut, assemble and paint. 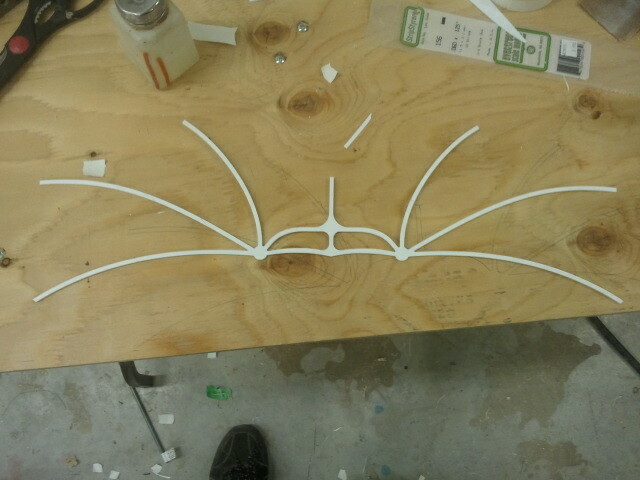 The whole thing is made from 1/8" pvc, and styrene. The wingspan was around 16". I used a really stiff paint brush to streak a woodgrain on the plastic, then mixed up a brown colour and mixed it into a clear urethane and sprayed it on. It looks convincingly like wood. I found a small bicycle toy at the store and decided to get it for the model. It had spoked wheels, and pedals. Both of which I thought would be awesome on the model. I added some small runs of brass wire as cable stays, then it was done. After we loaded everything up on Monday, we headed out to the location which was about 2.5 hours away at a beautiful farm that was built in 1861. We assembled it in the barn. Sadly it was after dark by the time the truck arrived with the plane. However, the lighting guys had a generator in the barn, as well as 4k light ready to go. So there was plenty of light to work by. After it was all done, we were invited to stay for dinner, and we gladly accepted. The ride home was long, and it was freezing rain. 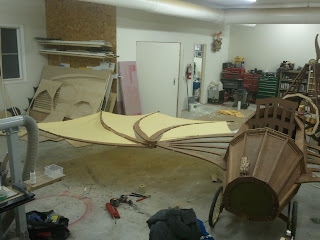 I wasn't able to get any final images as the barn wasn't big enough for the wingspan. I was promised stills by production, so as soon as I get them I will post them. The rest of this week should be really easy going for a change. 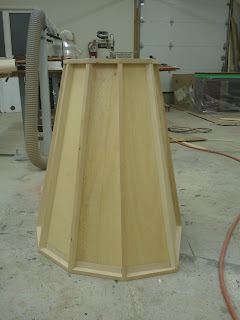 We have 2 trophies to make for a t.v. commercial. The fun thing is that they are trophies for a rock/ paper/ scissors competition :) They're on a tight budget, so we will just hack a couple of existing trophies. It's always different around here, that's for sure. I started the day by getting the tail section pieces cut. Another important script detail is that the 'inventor' of this aircraft does a bunch of flight tests with ordinary household objects. 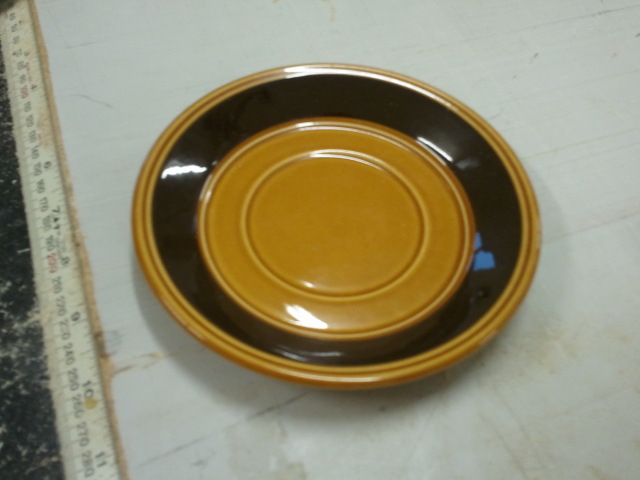 One of the objects that performs well is a dated looking saucer from the kitchen. 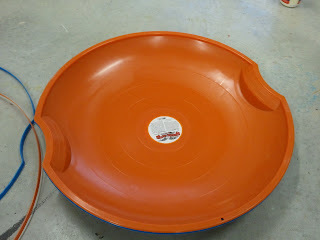 We were asked to incorporate the look of this saucer on the plane. We decided that the tail section would be a good place for this saucer shape. A little ugly, but it's supposed to be set in the 40's-50's. I had spent a while trying to figure out the most cost effective way of arriving at this sort of shape. Now it doesn't have to be an exact duplicate, just be inspired by the saucer. I happened to be at Wal-Mart, and saw these kids round toboggans. Plus they were cheap! The only problem is that these are made from Polyethylene. One of the hardest plastics to do a colour change on. We have our ways though. We actually have earned a reputation as being able to get paint to stick to anything. We got a call once because a director had heard that we had gotten paint to stick to a mop, and he needed a complete colour change on some liquid laundry detergent bottles for a Tide commercial. It's funny how things can be. .This is the assembly that will hold the toboggan. I drew it with a rabbet in it to allow the saucer to mount into the frame for a custom look. I had to machine off the lip on the saucer to get it to work, but it's gonna look great! 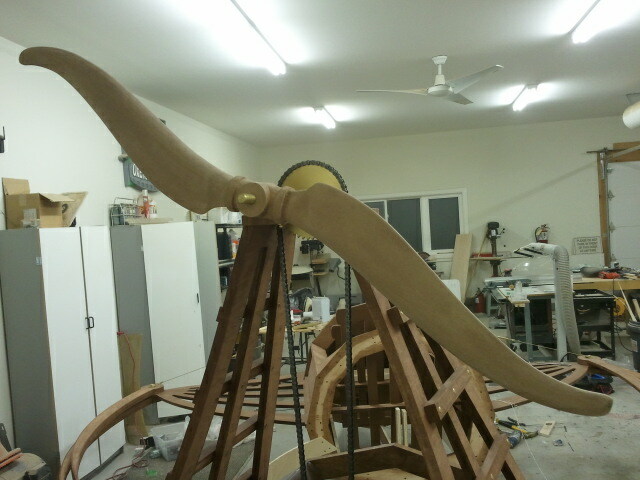 I also got the propeller machined up as well. There is just sealer on the MDF right now, but as it will be spinning the whole time, there is no need to do any faux woodgrain finish on it. I haven't decided if the blade mount should be black or brass colour yet. I guess I will wait until tomorrow for that puny decision! Tomorrow should be a long day I think. 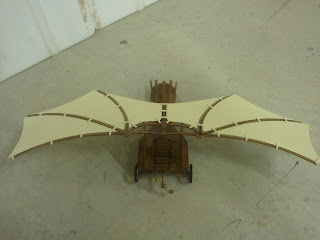 I still have to build the scale model of a similar flying machine, and get the wing fabric done. Should be fun though. Jody and I went into the shop to day to do a few things on the flying machine. Jody started cutting the fabric for the wings while I was able to draw up the seat backs in Aspire. The fabric is very specific. It is the same fabric that is being used in the inventors house, and needs to be incorporated into the plane. 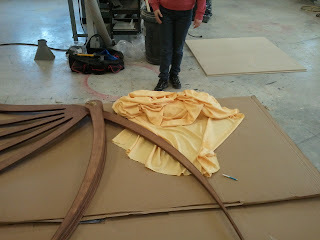 While she was cutting all the fabric, I was able to stand around and watch our Techno cnc cut the seat backs for no other reason than it's cool! Being that the camera will never be close enough, or high enough to see into the cockpit, we don't actually need seats, just the backs. I carried the seat backs all the way down to the bottom frame so the camera wasn't limited on it's crane shot. One of the script requests was that it be VERY evident that there are TWO seats in this. This is why we raised the rear seat up higher than the front one. A small, but important detail nonetheless. As I couldn't handle anymore edge-banding for this year, I cut the seat backs from 1/2" MDF and just applied the same stain. It works very well and doesn't appear much different than the rest of the plane. I headed out today to grab the drive chain we will be using to spin the prop. I had already picked up the sprockets and hub last week and got them welded together, as well as the 5/8" threaded rod we would use as the shaft. I had to draw up a couple of new pieces in Aspire that we needed to mount everything together for the prop. All in all it went fairly smoothly. 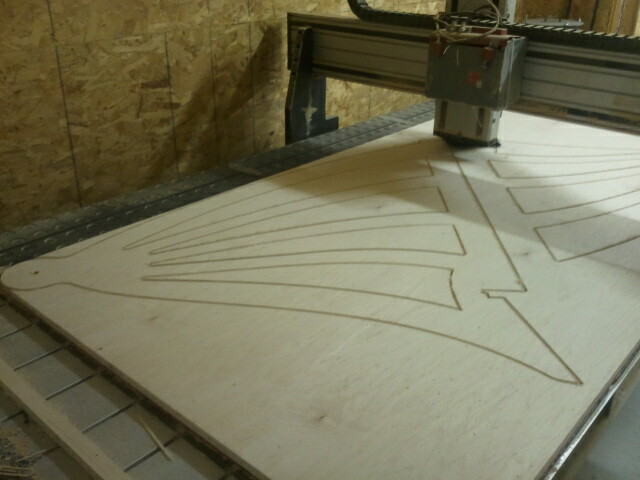 By smoothly, I mean that I only had to cnc 1 piece over again. The top system got a coat of brass paint and installed. I know that the drive system would NEVER be made from metal as soft as brass in the real world, but the colour works so well with the wood. The greatest thing about living at this point in history is the technological advancements that humans have made. 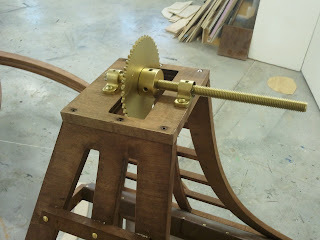 If this was 150 years ago, the motor required to make this fly would be so prohibitive to use. It would be inefficient, heavy and smelly. But we as people have come such a long way now, motor advancements have come in leaps and bounds. Now a motor for a flying machine is small and lightweight, as well as running 100% electric. This would have never been possible at any other point in history. Plus, when the shoots over, they can use the motor to remove all the screws from the flying machine so it fits back in the cube van. You'll notice the advancements in throttle position mechanics as well. This proven system rarely fails, and can be found on numerous movie props. Throttle position can easily be changed by simply changing the tension on the adjuster screw. However, as advanced as we've become, flight with this propulsion system is somewhat determined by the length of available extension cords. Today I started at the shop a bit later than I thought. I had to do a dump run to get rid of all the wood from doing all the windows at home. I started designing the landing gear supports when I arrived at noon. This was something I had left until near the end as I couldn't wrap my head around every little geometric condition. On this build, I worked from my 3d computer model, laying all the parts out in Corel and Aspire as 2d vectors. But now that the main fuselage is built, I can physically see and measure the places I need to affix the landing gear frame. 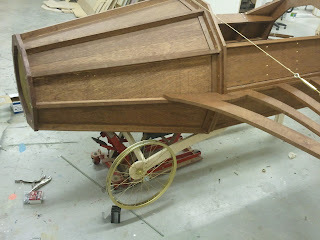 I was able to pick up 4 bicycle wheels last week for this, and got them sprayed up in a brass colour today. I chose bike wheels because I loved the idea of spoked wheels. And bicycle wheels are fairly dainty, which adds to the look that some parts of this flying machine might be slightly under-engineered. As the director wanted it lower in the front to show the wings, I put on 20" wheels in the front, and 26" wheels on the back. 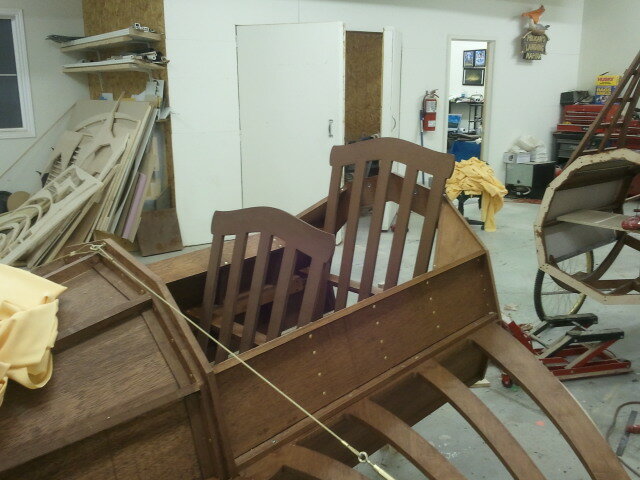 I removed the rubber for painting, and will fire that back on tomorrow first thing, then stain it all up. 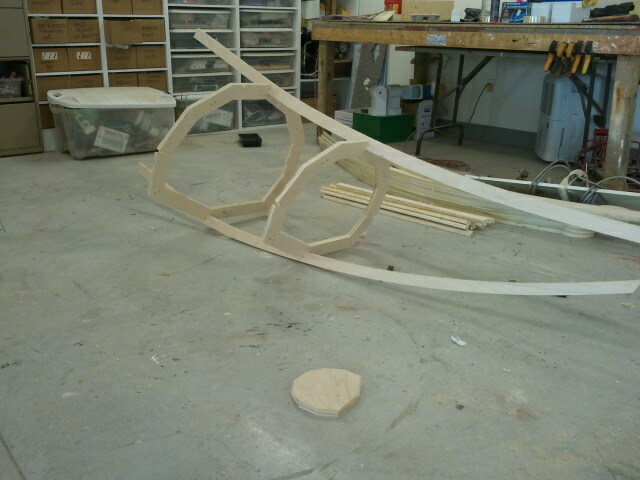 I still have to glue up the MDF for the propeller. I should get to that tomorrow as well. 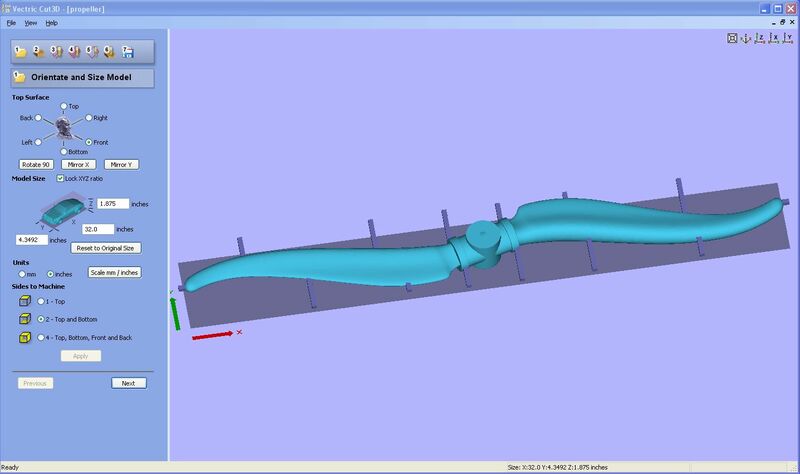 Saturday I will machine the propeller, which has been designed in Hexagon, and toolpathed already with Cut3d. All things considered, we are doing well despite the 5 day window interruption to our schedule! only a few steps left! Friday evening the Director, production designer and the production manager came up to the shop to see the flying machine first hand. It took awhile to really clean up the space to showcase where we were at with it. And with a 25' wingspan, we needed all the room available. Because everything was all built in the computer first, and cut using Aspire and our Techno cnc, all of the parts fit together perfectly. I have also had the super large job of replacing all of our doors and windows on the lake side of our house. We face north west, and the wind in the winter can be extremely fierce. We replaced 2 sliding doors with windows, replaced another sliding door and 5 more windows. As I also wanted to add some additional R value, we cladded the outside with a urethane board with foil on both sides. We also added house wrap. Me and Jody have been going solid since Saturday morning. 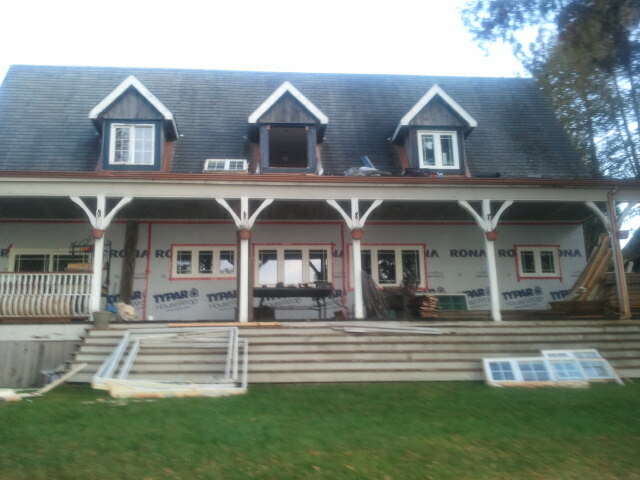 Tomorrow should be the last of it except for all new trim on the outside in the spring. Oh yeah, all new trim and drywall work inside as well. So we will be back on the flying machine hard on Thursday. There is not that much left compared to a week ago. We still have the chain drive for the propeller, the wing fabric, the tail disks and the 4 wheels for the landing gear. It's gonna look sweet when the wings pop open on camera. 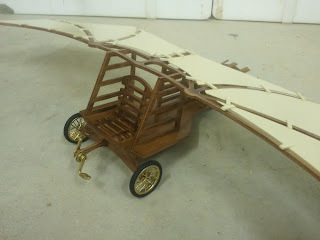 The other thing we have to fabricate is a model of a flying machine that will hang in the 'inventors' study. It will kinda look like the version before this one. Everyone was really happy with how it's coming along, and look forward to Tuesday when it gets delivered to location. Sigh. The edge banding is almost done. Edge banding...................................That's all I'm gonna say. It's a bit funny how things change, the season's, music, fashion, and my desire to edge band. 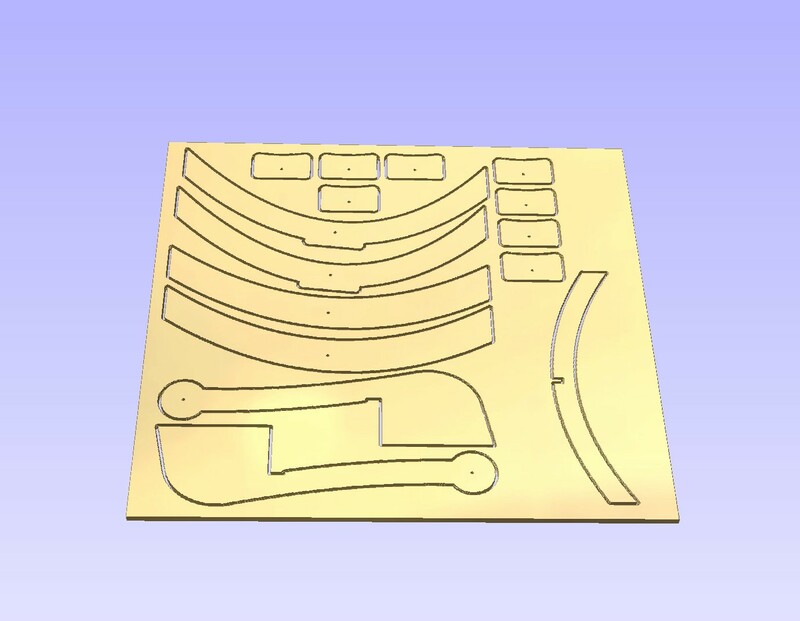 I now am deciding very carefully if I want to even cut a piece on our Techno cnc, as I know what that means..................more edge banding. Tomorrow I have decided that I should let someone more qualified take this task on. And by qualified I mean not me :) Jody should do this. Yeah that's right, give it to Jody. She's gonna loooove me! That poor girl, she's always gettin stuck doing the 'less than super-crazy-awesome' tasks, like sanding, and sanding, oh yeah....sanding. I sound bitter, but I truly am not. I worked Saturday and Sunday on doing some more designing and routering, and figuring out how this will attach to that, etc. Our Techno cnc got a workout cutting even more pieces today (look at all those edges that need edge banding ;) These pieces become the first section of the fold out wing system. 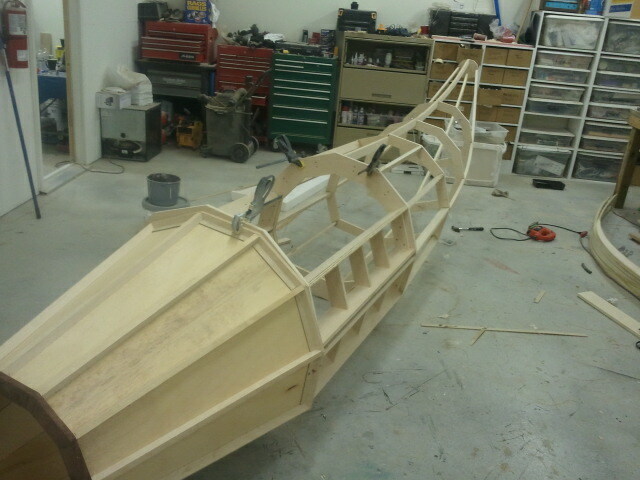 The fuselage is now fabricated and clamped together. It is very solid, despite it's open tail framing. The tail will always be open with the exposed framing. It does have aircraft running down the length to add to the look. This portion is just over 17 feet long, so it's a small/big plane I guess. 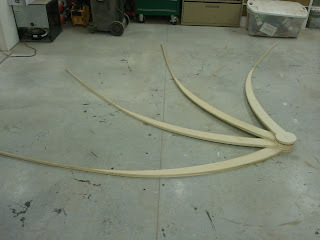 However the wingspan will be over 25 feet when they are fully open. 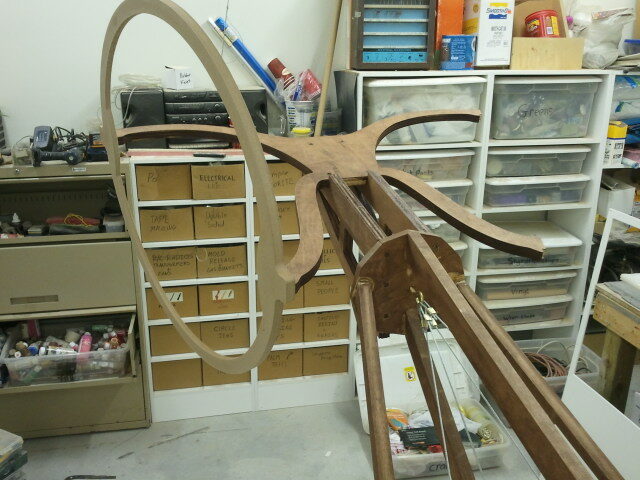 Here the propeller tower is sitting in position. It's not totally finished, as it needs edge banding as well. It also gets some add on pieces that are both structural and decorative. These need edge banding too. 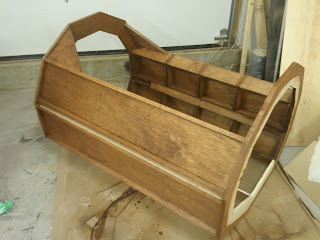 I have been taking a break from the banding and been applying stain here and there. 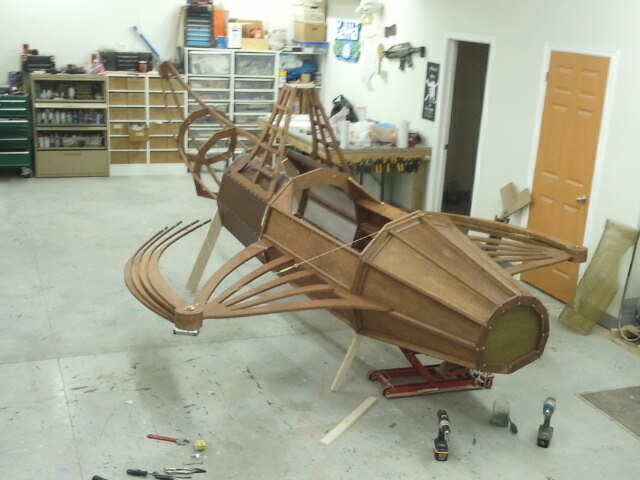 It looks good with the first wing section in place. Will the edge-banding ever end? Yesterday and today was pretty much edge banding central. So far we are at 160' of edge band with more to come. I don't have an edgebanding machine, so we do it old school- an iron and a steel block! As all the plywood edges, inside and out, are being done, it's taking forever. 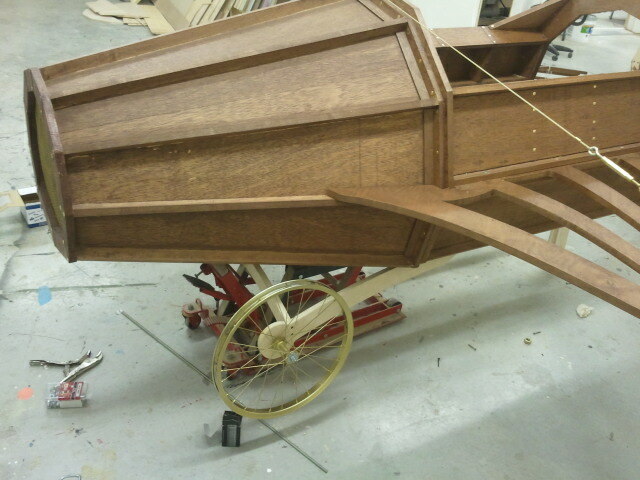 I did get the nose cone finished, so thats ready for stain and the brass screening in the opening. This job has been a fair amount of math so far. Even though I have a lot of extremely useful and powerful software at my fingertips, sometimes it boils down to good old math. As a kid, I hated math. I NEVER would have thought that my job would be using it all day long! It's funny how one's perception can change based on interest alone. I was also able to finish the tail section. 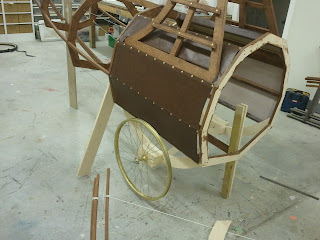 This was a little complicated as well, but perseverance and a deadline always win. Tomorrow I will start the section where the seats are going to be, this portion is at least straight with no tapers, so it should go well. I haven't figured out how to make the wings removable for shipping, while keeping the strength, but as soon as it starts coming together, it will become apparent. The tail is almost 12' long, so I didn't think it would stand up in the shop, but it did! 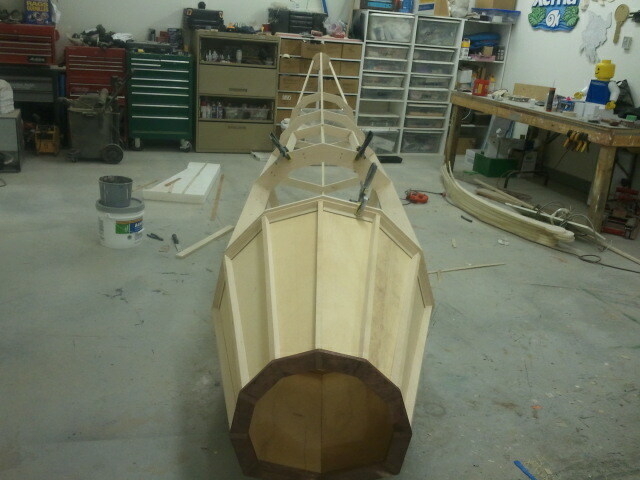 The very bottom section will be covered in either a fabric or leather looking vinyl. I haven't totally decided yet. 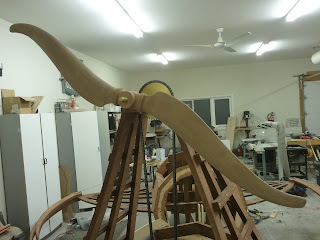 I also decided to add a propeller tower with a belt driven prop. This will spin rather slowly, like it has a clutch thats almost engaged. Kinda like a chainsaw blade spins fairly slowly when it's idling. I am also hoping to get the cable tensioners in tomorrow as well. Busy weekend for sure. 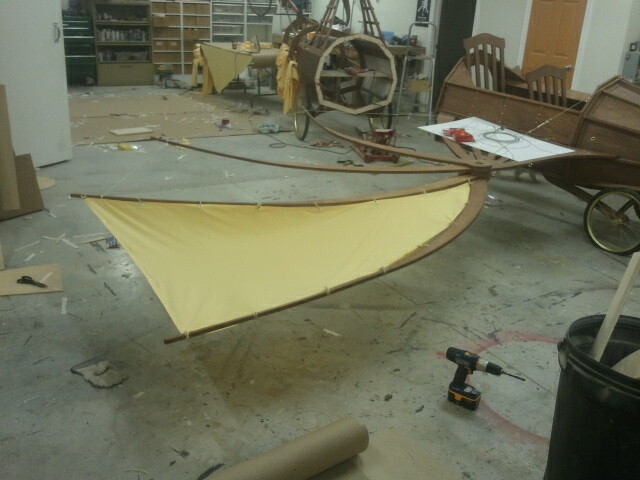 Today was slow all around for the flying machine. A wooden desk mysteriously appeared last week on Thursday, and it needed to be refinished quickly for an upcoming project. That's where most of today went. I did manage to get some more ribs cut on our Techno cnc though. Again, our Techno flew through the parts without much complaining! I had some time to clean up a few pieces and dry fit them together. This plane is getting bigger by the minute. But that's because it's inside, on location it will look fairly small-exactly the look we want. We have a meeting tonight at 7 pm, and that should clear up any changes that are going to happen regarding the build. With 2/3 of the tail section dry fit and stretching to 8 feet, it's gonna be cool for sure. Not the most flattering picture, but you get a sense of the bones of this machine. 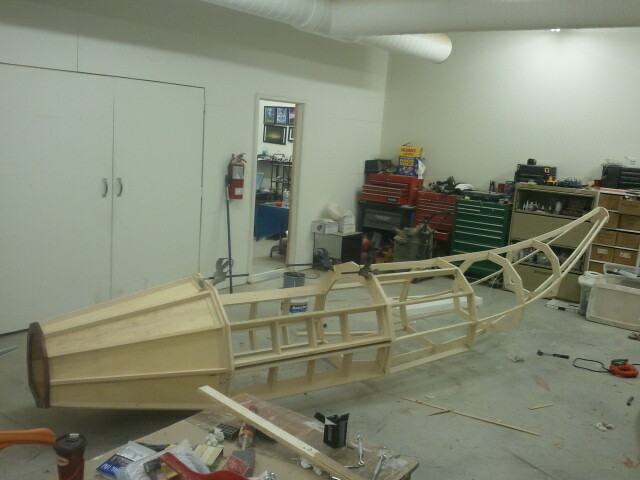 The whole back section of the tail will be open framed, adding to the look we want. This is gonna be great! I had a bunch of letters to cut on our Techno cnc yesterday, so I didn't get around to getting the materials for the flying machine until today. I didn't grab all the materials, as this job will get a little complicated, and I haven't gotten my head around all the components yet! 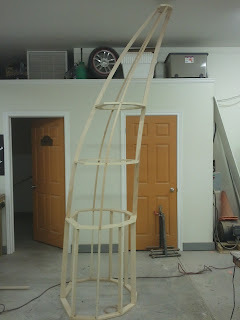 The main structure, and the wing geometry is all figured out, so I started cutting into the material for that at around noon. I managed to get the moving parts of the 'Davinci' styled wings cut. These will be 4 curved 'fingers' that will have some sort of lightweight fabric attached between them, kinda like a bats wing. 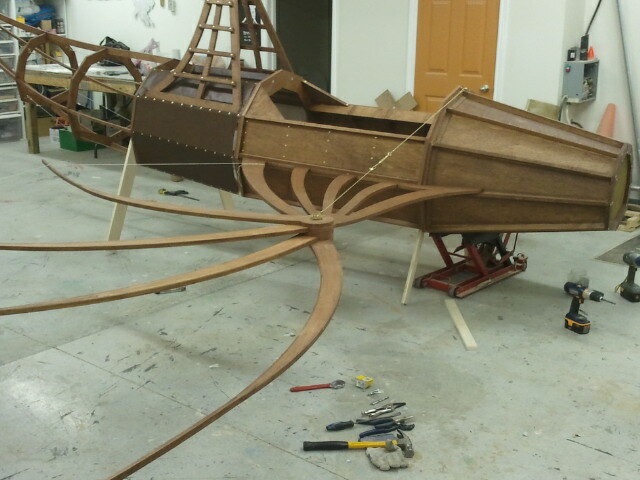 These will be retracted back to the body of the plane, and upon pulling a cable, will open up and stretch the fabric. The nice thing about this prop is that it needs to look like it was hand built by an inventor with more book knowledge than practical knowledge. So we will have exposed tension cables, some pulleys, etc. Our Techno cnc cut throught the starting pieces pretty quickly. I finally got a vacuum hold down for it, and I am not sure that it's 100% set up right. So if anyone has any tips or tricks, I would love to hear from you. It's an 8.5 hp regenerative blower style. It seems to be pulling 12 hg with all the valves closed, but sucking through a surfaced piece of 3/8" mdf, with a sheet of sintra on it, the gauge reads 8 hg. I suspect this isn't quite enough vacuum for the jobs I have planned, so I will keep searching out information. Anyways, the 8 fingers got cut. 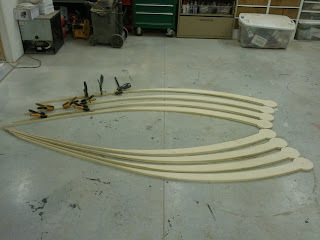 I also ripped up 1/4" X 3/4" strips that get attached to each side of these fingers. This will give me the extended length on the fingers, while keeping them strong and lightweight. These fingers will attach to another open framed piece that will then attach to the body of the machine. All of these have a central pivot point, allowing them to open via the cable system. 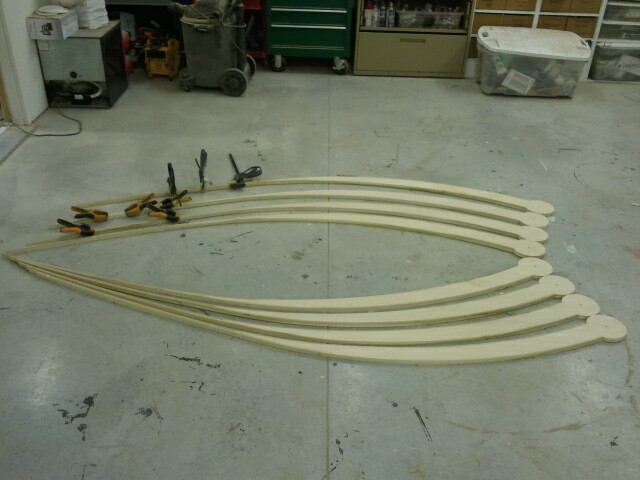 These parts are a lot bigger than they appear, each finger is around 8 feet long. This is the position they will be in when fully open. I think it's gonna look pretty sweet with the fabric webbing. This machine is going to be quite nice when its all done. 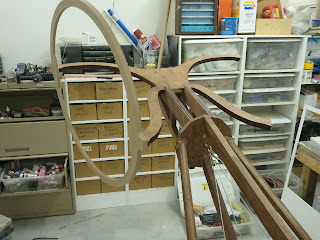 We are going with a mahogany stain on maple wood, and will have a lot of brass hardware. I'm a little excited to start up again in the morning! Jamie is the owner of Oxenham Design, a full service props and miniatures company. Jamie designs/ builds for the film, television and advertising industry, as well as creates highly creative 'over the top' dimensional signage. Running the company for over 10 years with his wife and partner Jody, they are fortunate to work on exciting and creative projects. For more information you can find Jamie on Facebook, visit the website www.oxenhamdesign.com or follow his blog.